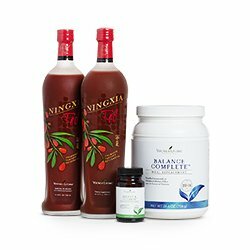 Five Day Nutritive Cleanse Detox Kit contains NingXia Red, an energizing, replenishing, whole wolfberry nutrient infusion; Balance Complete, a fiber and vitamin, meal replacement powder and nutritive cleanse; Digest and Cleanse which soothes and cleanses gastrointestinal upset and supports healthy digestion*. Also provides antioxidant support*. This kit facilitates gentle and effective cleansing to support your wellness goals easily. Comes with complete instructional book and guide! Support yourself with the right nutrients in your body, to facilitate detox and/or loss weight! This is an easy reference guide for Five Day Nutritive Cleanse Kit. It will tell you how to use it and what to use it for! Want to Purchase the Five Day Nutritive Cleanse Detox Kit? What is in Five Day Kit? Make it complete and add Life 9 Time Released Probiotic Supplement! What are the Documented Uses for Five Day Nutritive Detox Kit? Absorption of nutrients, colon detox, digestive efficiency by supporting healthy digestion, detoxification, general wellness, healthy liver function, skin, toxicity, and healthy weight loss when in combination with exercise. Supports healthy digestive system*. Please refer to the individual pages for use information. Can this product be used for Animals? Yes, but please refer to the individual supplements for more information. NingXia Red in particular provides a safe and excellent source of antioxidants for animals. What are the Safety Precautions? Please refer to individual product for specific information. Keep in a cool place away from excessive heat or direct sunlight. If you are pregnant, nursing, taking medication, or have a medical condition, consult a health professional prior to use. Do not give this product to children under 12 years of age except under the supervision of a health professional. Keep in a cool dry place. Want to Purchase the Five Day Cleanse Detox Kit?